We recently featured this book on our Love it or Hate it post and since neither of us had read it. We both felt that we should review it and weigh in on the debate with our opinions. Check out whether we loved or hated this book. Synopsis (from Good Reads): Things have never been easy for Oscar, a sweet but disastrously overweight ghetto nerd, a New Jersey romantic who dreams of becoming the Dominican J.R.R. Tolkien and, most of all, of finding love. But he may never get what he wants, thanks to the fukú — the ancient curse that has haunted Oscar’s family for generations, dooming them to prison, torture, tragic accidents, and, above all, ill-starred love. Oscar, still dreaming of his first kiss, is only its most recent victim – until the fateful summer that he decides to be its last. Jen’s Review: (4.5 stars) Although I usually agree with our Hate it reviewer, this time I will have to disagree (despite the fact that her review was hysterical). I really liked this book although some of the crude, crass language was not really my thing. What I loved was that it was complex, emotionally touching, and felt very authentic. With a sprinkling of magical realism, this coming of age book left an impression on me that will remain for some time to come. Reading this book was like peeling away layers of an onion. 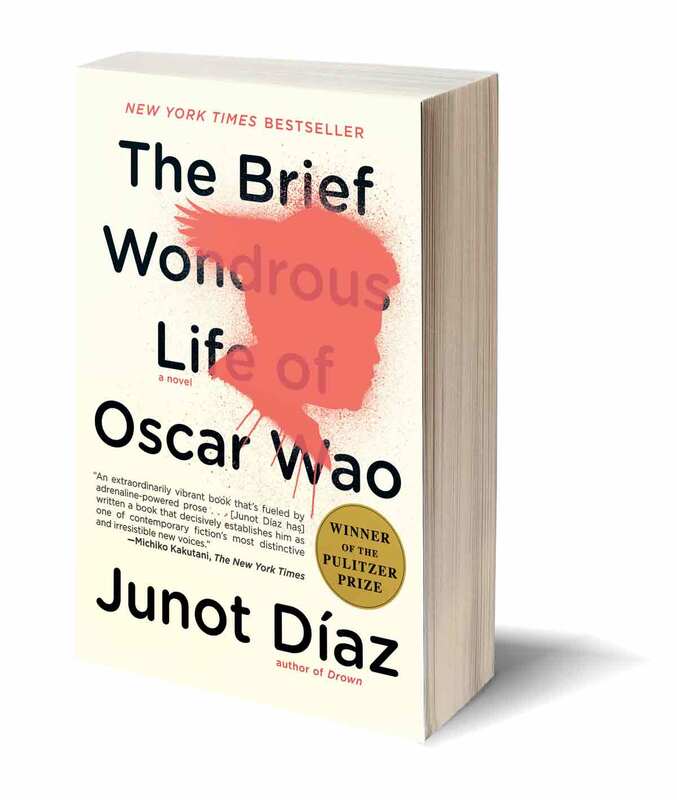 You start out hating the parenting and thinking how terrible Oscar’s mother was toward both her children, yet, as you read further into the book, Diaz shows you why people developed the way they did and how manifestations of love are impacted by cultural experiences of trauma. The book was told from the perspective of different characters. I disliked the sections from the viewpoint of Lola’s “boyfriend,” Yunior who I found to be obnoxious, self-centered, and uninteresting as a character (perhaps a little too close to my own experience of machismo reminiscent of my adolescent boyfriends in Costa Rica) but I loved the sections that were set in the Dominican Republic. Oscar and his family can only be understood in context of their cultural experiences and background. I really enjoyed reading this book and you can consider me in the “love it” camp! Readers should be warned that there is a fair amount of Spanish slang in the book that the author leaves untranslated. Not a problem for me since I speak spanish and I think it adds to a more authentic sense of voice throughout the story. While the title may lead you to believe this is a book about Oscar Wao, it is actually the story of his family from his grandparents down to the present generation. It is also a book about the Dominican Republic and what it meant to be a citizen living through the brutal reign of El Jefe. I really enjoyed this book on a number of levels. The first was the opening where we learn that Oscar’s family believe they are living under a fuku a powerful curse that has effect through the generations. Secondly, I enjoyed the switching focus of the narrative and the nonlinear timeline. We move from Oscar’s childhood to his mothers teenage years, back to Oscar, onto his sister Lola, and then to his grandparents as the full story of the family is revealed. Thirdly, I liked Oscar I could relate to him and his meekness. I enjoyed the references to Star Trek, Lord of the Rings, role playing games, and books. Finally, while I can’t say I enjoyed the sections in the Dominican Republic where things go wrong and reprisal are swift and harsh, these sections added depth to the book. This is definitely a book I recommend everyone should read. 1) I also disliked the use of the “N” word. 2) The un-translated Spanish didn’t bother me even though I couldn’t understand the actual words you get the idea from the context. 3) My only objection to the footnotes was the size of print with regard to the content I enjoyed the snarky history lesson and social commentary. 4) I actually liked Yunior his voice was authentic to me and he wasn’t trying to be anything other than what he was – a player. We want to hear from you! What did you think of the book? Did you love it or hate it? Make sure you voted in our poll for this book a few months ago. Amazing book. Thanks so much for sharing! I read this novel when it first came out. I didn’t love or hate …Oscar Wao. I wanted to like it more, but just lukewarmed it. Diaz is a great writer and I love his voice; but I, as a whole didn’t find Oscar as a character that compelling. I liked the historical and cultural references found in the footnotes, as Book Worm pointed out. If I’m remembering correctly, around the time the book was published, footnoting in fiction had become sort of a trend (a spin off David Foster Wallace’s writing, perhaps?). I’m really a fan of Diaz’s previous books (This is How You Leave Her; Drown). Spectacular, vivid writing; like them or not, the characters are animated and intense; and the stories so “in the moment.” Maybe because I speak Spanish and have spent time in the DR (and listen to a lot of hip hop), I “get” the colorful language and use of the “N” word. When used in the context of Diaz’s story, the word doesn’t bother me at all. Hearing the word spoken on city streets does, however, where it feels more menacing. My husband and I absolutely loved this book, the sense of humor, the magical realism. We rarely love the same things, but this book became such a subject of conversation that the share enthusiasm certainly enhanced the reading experience (usually quite a lonely pursuit!). And it was quite interesting hearing Junot Diaz speak about his writing and how this book came about when he was in town a few months ago. Quite an unforgettable guy. I have heard that he is a great speaker. I would like to hear him speak one day. I’m glad you also liked the book. Thanks for your reviews! This one has been on my reading list for ages.